The Deng people, also known as the Dengba, live mainly in the valleys of the E Qu, Zayu Qu, Gedo Qu, and Dolai Qu rivers in Zayu Township of Zayu county in Southwest China's Tibet Autonomous Region. Presently there are about 1,300 Deng people in Zayu County, distributed mainly in nine Deng villages. Although they have no written language, the Deng people have their own spoken language, which derives from the Tibetan-Myanmar branch of the Chinese-Tibetan language family. Since they have no written language, they keep records by notching wood, tying knots, or arranging sticks or branches. The Deng people believe that everything in nature has a soul, and have a custom of killing animals to exorcize ghosts. The Deng people live mostly by agricultural production, raising millet, corn, and vegetables, such as pepper, bean, and taro, with gathering as the major sideline. They also hunt and raise domestic fowls. They live in two-story structures, themselves living above, while housing cattle and poultry below. Their houses are long and windowless, like porches, with bamboo or wooden walls and floors. They have distinctive wedding and funeral customs as well as many taboos. They enjoy drinking and smoking. Their costume is different from those of the other minority groups in Tibet. Women commonly wear long, sleeveless blouses and straight skirts and go bare-footed. They favor drum-like silver earrings, a headdress covering the forehead, and a string of beads or silver jewelry around the neck. 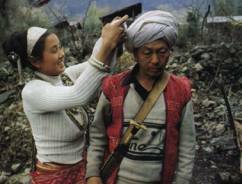 Men wear long, sleeveless shirts and scarves, which are made of cloth woven by the Deng women. In addition, most of the men wear a black headscarf and silver earrings and always carry a knife on their belt, a necessity of everyday life and production. Before the 1950s, the Deng people lived deep in the primeval forests in the mountains, leading a primitive life in which they cut rope into different lengths to record events, cultivated farmland by reaphook, and controlled weeds by spreading fire. Having no transport facilities, they rarely had contact with the outside world, and life was difficult. They were always looked down upon because of their poverty and were even nicknamed "monkeys" or "wild people." Today, they have moved into terraced river valleys with the help of the government. Each Deng family has its own beautiful wooden residence, surrounded by flourishing flowers and trees and a good view of distant green terraced fields. The Deng people have started their modern life with modern household appliances such as telephones and TV sets. With the improvement of their living standards, their minds have changed. Now they are masters of their own lives and enjoy equal rights with the other Chinese people.